That rare coming-of-age story able to blend the dark with the uplifting, Irma Voth follows a young Mennonite woman, vulnerable yet wise beyond her years, who carries a terrible family secret with her on a remarkable journey to survival and redemption. Nineteen-year-old Irma lives in a rural Mennonite community in Mexico. She has already been cast out of her family for marrying a young Mexican ne'er-do-well she barely knows, although she remains close to her rebellious younger sister and yearns for the lost intimacy with her mother. With a husband who proves elusive and often absent, a punishing father, and a faith in God damaged beyond repair, Irma appears trapped in an untenable and desperate situation. When a celebrated Mexican filmmaker and his crew arrive from Mexico City to make a movie about the insular community in which she was raised, Irma is immediately drawn to the outsiders and is soon hired as a translator on the set. But her father, intractable and domineering, is determined to destroy the film and get rid of the interlopers. His action sets Irma on an irrevocable path toward something that feels like freedom. A novel of great humanity, written with dry wit, edgy humor, and emotional poignancy, Irma Voth is the powerful story of a young woman's quest to discover all that she may become in the unexpectedly rich and confounding world that lies beyond the stifling, observant community she knows. Jorge said he wasn't coming back until I learned how to be a better wife. He said it's okay to touch him with my arm or my leg or my foot, if it's clean, when we're sleeping but not to smother him like a second skin. I asked him how could that be, I hardly saw him any more and he said that's a good thing for you. He said people always lie about their reasons for leaving and what difference does it make? I blocked the doorway so he wouldn't leave and I begged him not to go. He put his hands on my shoulders and then he rubbed my arms like he was trying to warm me up and I put my hands on his waist. Who is Irma Voth? What is she like when the novel opens? Is she the same person by the book's end? What changes about her - and what does not? What are your impressions of her family? What is her role among the Voths? What are the dynamics like between Irma, her parents, and her siblings? Do you like her parents? Can you understand their choices? Irma has been raised in a strict Mennonite community. Is religion important to Irma? Does she believe in the same God her father does? How has it shaped her character? How would you describe her marriage? Why did she marry Jorge - and why did he marry her? Was it love? Toews writes honestly and with humour, and her balanced style makes her work accessible to readers. We are given a beautiful literary story that becomes much more real with Toews's interjections of observational wit. Her narrative never seems forced, and it feels as though you are listening to a friend relay a tale. (Reviewed by Jennifer Dawson Oakes). [T]he wryly funny title character keeps the story poignant. A strong and skillful novel… a parable of redemption, a powerful theme… that leaves the reader with a comforting glow of hope. Simultaneously poignant and humorous... perfectly captures this young woman's attempt to find her niche in a world so different from that in which she was raised... Toews's unique voice shines. A literary novel marked by charm, wit and an original approach to language. 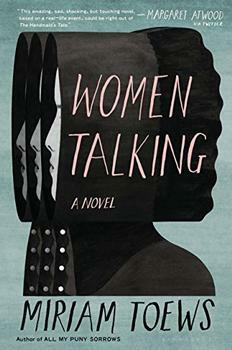 Toews… combines an intimate coming-of-age tale with picaresque and extremely effective prose. In this compelling and beautiful novel, Toews's quirky and authentic voice shows increasing range and maturity. She is well on her way to fulfilling her promise as an important and serious writer. Menno Simons was an Anabaptist religious leader born in 1496 in Witmarsen (the Netherlands). Although he was not the founder of this branch of religion, he was a very important figure in the organizing of the Dutch Mennonite church, and his followers became known as Mennonites. Based on real events and told through the "minutes" of the women's all-female symposium, Toews's masterful novel uses wry, politically engaged humor to relate this tale of women claiming their own power to decide. A beautiful and heartrending novel about motherhood, resilience, and faith - a ripped-from-the-headlines story of two families on both sides of the American border.